This involves a more menacing challenge, namely holding the object. My theory is that if you can securely hold the object, you CAN engrave it. The most common work holding method is double-sided tape. This may seem a bit odd at first but you will soon find that having a well stocked tape dispenser is handy. Double-sided tape gives you the ability to secure flat plates easily to your worktable. Usually a small amount will do the trick. Almost all suppliers of engraving materials will offer some version of hold down tape. This tape is designed to secure the object but not to leave any adhesive on the plate. If you do use a tape that leaves a residue, you can do a little clean up with acetone, lighter fluid or a glue remover like "goo gone". If you plan to do a large number of plates you may consider one of the new disposable hold down sheets. These sheets of material have no adhesive in them however they do keep flat plates from sliding on the surface. Usually the sheet is made of a rubberized material that has a surface tension that when in contact with the bottom of the plate will prevent any slipping. The plate can be quickly pealed up and another can be put down. Some types of clamps are designed for flat plates such as small badges, plastic signs or trophy and plaque plates. These small clamps will be of two major designs. One will be used to push the plate against the table back stops or scale bars (if your table is equipped with these). The other style of clamp can be used to "pin" the plate down. I personally like this style because the plate is pinned with a down pressure. A plate that is secured from the side can have a tendency to bow. Figure 8.3 illustrates a jig that is used for holding seals. If you are looking to secure an odd shaped object such as a baby gift, pen or shaped key tags then a vise and pair of clamping jaws (See Figure 8.4) will be the order of the day. Most pantographs and many models of engraving system will be equipped with a vise instead of the flatbed-engraving table. These systems lend themselves to gift item engraving. The vise is designed to secure many odd shaped items or is designed to accept a wide range of clamping jaws. If your equipment was designed with a flatbed table you may be able to use a separate vise for the occasional odd item. Check with the equipment manufacturer for the model designed for your particular system. The jaw pairs that are available are endless. Many are designed for specific applications like pens, while others are designed to be very "universal". Regardless of the type you have, it can be wise to build up a library of various jaw types for those special jobs. The wrong workholding jaw or clamp may have been used. Sometimes trying to substitute another jaw for the correct one will get you into trouble. Also, having jaws or clamps that are badly worn can cause slippage. Over-tightened jaws on some designs will cause the part to be under pressure and pop out of the clamp the minute the cutter touches it. Some odd shaped items, although apparently tight in the jaws, may rock back and forth when down pressure is applied. There are only a limited number of tricks that you may do to help the situation with some difficult shapes. One procedure you can try is to build up areas underneath the object with scrap material to stabilize it and eliminate movement. A little trick used by some is to leave the item in its original packaging and secure the entire package. Examples are objects like lighters that come in their own plastic presentation case. The lighter may have an uneven shape, but the packaging is rectangular and can be easily clamped. A little extra tape to hold the lighter in place will do the job. You may have too much down pressure applied. This is just as important with or without a nosecone. 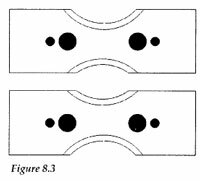 If the diamond pressure is too great during drag engraving, the side pressure of the tool in the material may cause it to move. Also, using the wrong diamond can cause the same problem. A 90° or 100° diamond that can dig into the material may actually "grip" the material and cause it to move in the workholder. The vise or jaws may not be tight enough. This is tricky if you have gift items that have thin walls and scratch, mar, or deform under pressure. Most engravers use masking tape to wrap the item to be engraved. This protects it as well as providing a nonskid surface to clamp to. Check out your local kitchen store for a thin non-skid rubber liner. This material can be cut into shapes easily with scissors and can be used over and over again. Try to cushion the object to be held. There are several manufacturers that provide a universal clamp that uses small dowel pins to secure the object. These pins are usually made of steel and along with the possibility of scratching the gift item, may actually cause it to slip while engraving. Hardware stores carry rubber caps or tubing that can be cut and placed over the dowel pin. This guards against both scratching and movement.